NATO Sec Gen Jens Stoltenberg specified on Monday the conditions for Macedonia getting an invitation. “Of course, the decision will be taken by Heads of State and Government at our Summit in July, but I expect and I hope that the Heads of State and Government can agree to start accession talks. Then, of course, we’ll all be able to invite the former Yugoslav Republic of Macedonia to become a full member if the agreement is finalised and fully implemented, meaning that we need full ratification, but also a referendum and a ‘yes’ vote in a referendum. But given that that happens, I am quite optimistic. Then, I think there are two separate decisions, whether to start accession talks to NATO and the European Union. 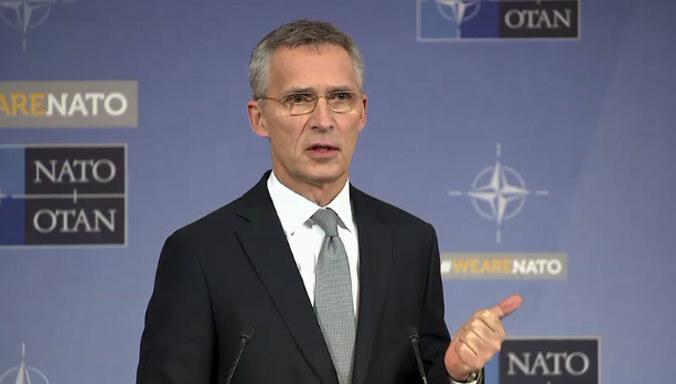 It’s not for me to comment on what the European Union decides, but I am quite optimistic when it comes to NATO also because we have reiterated again and again as NATO that we will invite the former Yugoslav Republic of Macedonia to become a member as soon as the name issue is solved,” he pointed out.